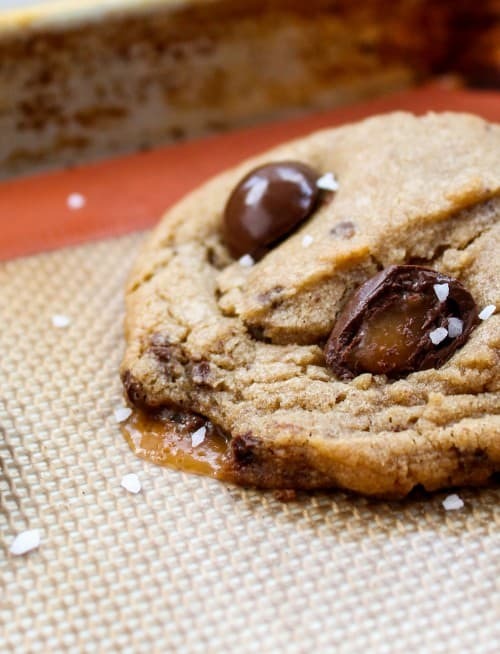 Brown butter makes cookies taste amazing! And just wait til you get your hands on these Sea Salt Butterscotch Caramels! Chop them up, mix them in, die and go to heaven. Sometimes when I mess up my mascara and end up with a giant black smudge on my face, I glare at myself in the mirror. Then I get even madder when I realize that the very act of glaring has made 3 more smudges. While we’re talking about makeup and stuff, I just want you all to know that I was so insecure about my thumb-shots while photographing this post that I stopped to groom my left thumb. I trimmed. I filed. I even considered painting, but decided not to because I didn’t want to get pink nail polish on my perfect cookies. Somehow my thumb still looks like Shrek’s. Although just to redeem my non-fashionable self a little bit, the outfit I wore today scored me 3 separate make-out sessions with my husband before noon. Now that’s what I call a winner. So, here’s the thing. 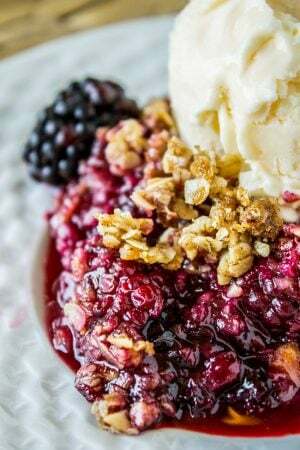 I run a food blog, and sometimes I feel lame going way over the top gushing about every single recipe. Sure, the food I post is pretty amazing, and always worthy of making again, but it gets boring to read food descriptions over and over, and I’m not gonna lie, it’s boring to write them. But I’m throwing all that out the window for this post. BECAUSE THESE ARE THE BEST COOKIES I HAVE EVER PUT IN MY MOUTH. They are my baby. I’ve been working on them for weeks, and my freezer is still full of reject dough. (Too flat. Too crispy. Not enough caramel. And on and on.) But finally, FINALLY, I got them just right. 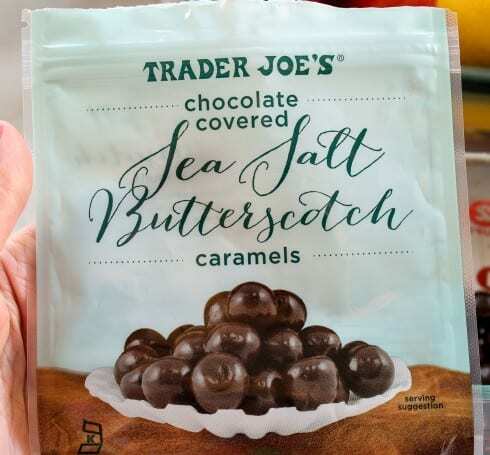 They sell these Chocolate-Covered Sea Salt Butterscotch Caramels at Traders Joe’s. I am obsessed with them. I will go to the store for the sole purpose of buying 3 bags, just to eat. And I’m not even a huge candy/chocolate person (I would take a brownie over a box of chocolates any day). But these caramels. My undoing. They are deeper than normal caramels, just on the line between caramel and butterscotch. They are covered in bitter chocolate and infused with sea salt to perfectly balance out the sweetness. I have been known to eat most of a 7-ounce package in one sitting. I chopped them and put them in a tender brown butter cookie. If butter is God’s gift to man, (this is completely arguable), then browned butter is like the secret awesome ninja twist that makes it way cooler. Aaaaand that’s where this analogy ends. It is essential to chill the dough completely, or your cookies will bake flat. They will still taste great, but the texture will be off. Chilling also gives the flavors time to meld. Sometimes perfection can’t be delivered in 20 minutes. 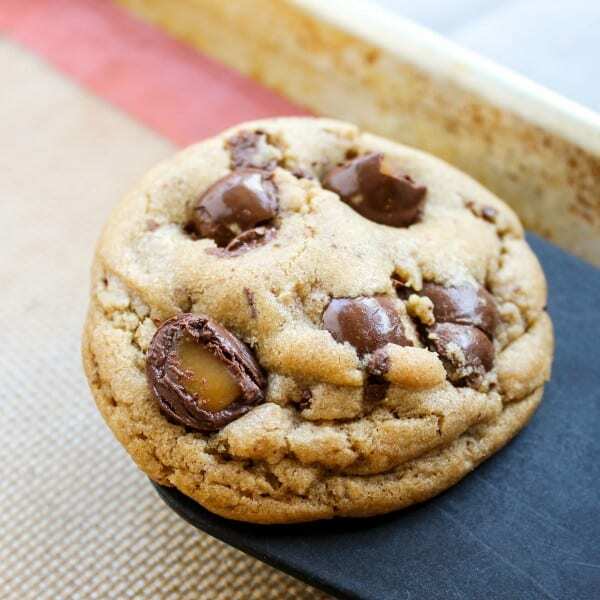 Chilling means you get a soft, gooey, tender cookie that shudders at the mention of “crispy.” Scroll down past the recipe to see some tutorial photos. I am anti plead-with-my-readers-to-make-my-recipes, but that rule is also being thrown out today. 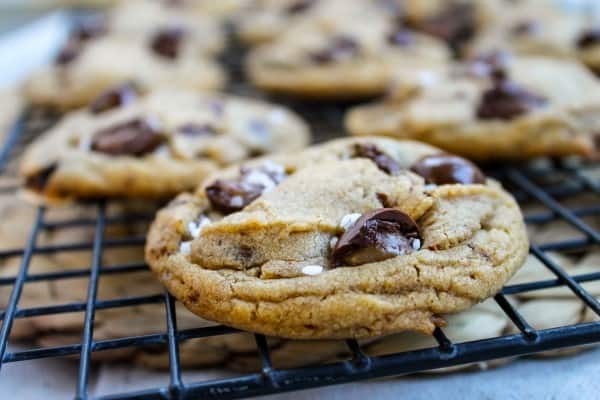 I love these cookies like I love my own children (how’s that for an obsession) and if you make them without telling me, I will never know, but if I DID know that you didn’t tell me, I would cry. 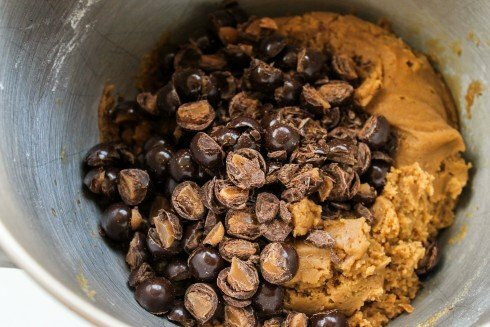 Make these cookies, then die happy. P.S. I asked my readers on Facebook yesterday what cookie they would choose if they could only have one kind for the rest of their lives. Chocolate chip won, of course. And several weeks ago, that would have been my choice too…but now it’s these Brown Butter Sea Salt Butterscotch Beauties. HANDS DOWN. I mean these hands are so down. In a small heavy-bottom saucepan, add 3/4 cup unsalted butter. Turn the heat to medium. Let the butter melt, stirring the pan occasionally. After a few minutes the butter will start to foam. Keep stirring every now and then. When the foam starts to subside, watch carefully to see the milk solids start to brown. The butter will stop smelling like plain butter and will smell nutty. Once browned, pour the butter immediately into a large bowl or stand mixer. Go here if you have never browned butter. Meanwhile, add the 1/4 cup Crisco to a mixing bowl or stand mixer. Add the brown sugar and granulated sugar. Beat well, scraping the sides and bottom. When the butter has browned, immediately add it to the sugar mixture. (The butter might burn if you leave it in the pan. If you sugar mixture isn't ready, pour it into a bowl.) Beat the butter into the sugar. Add the vanilla and sour cream and beat. In a separate bowl, whisk together the flour (spooned and leveled! ), baking soda, and salt. Add to the wet ingredients and stir until just barely combined. Dump the caramels into a separate small bowl. Use scissors to split the caramels in half. Add 3/4 of the chopped caramels to the dough, and stir them in gently. If your dough still feels hot enough that it will melt the caramels, refrigerate it for a few minutes, then stir in the caramels. 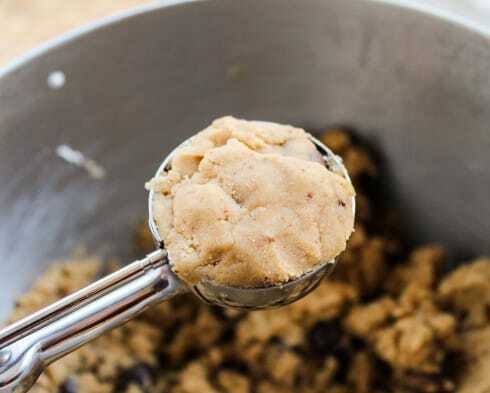 Use a 2-inch cookie scoop (or your hands) to form the cookies. If there is a chunk of caramel on the bottom, "patch" it with more dough (See photos below). Space them about 2 inches apart on a silpat or parchment-paper lined cookie sheet. Bake at 350 degrees for about 8-10 minutes, or until they are no longer shiny on top. Err on the side of underbaking. Remove from the oven and immediately top the cookies with 2 or 3 of the remaining caramel halves. Sprinkle with sea salt or other coarse salt. Let the cookies set up on the pan for about 5 minutes, then transfer to a cooling rack. You can sub Greek yogurt for the sour cream if you want. 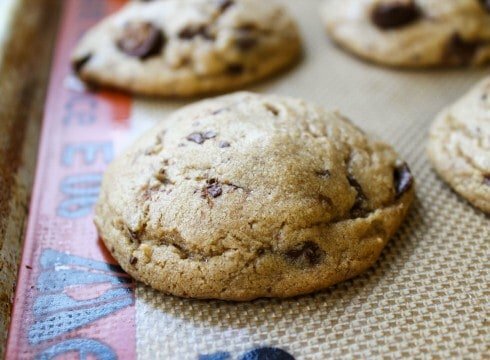 You must chill the dough for this recipe, or your cookies will bake flat. Put the dough back in the fridge in between batches when you bake them. 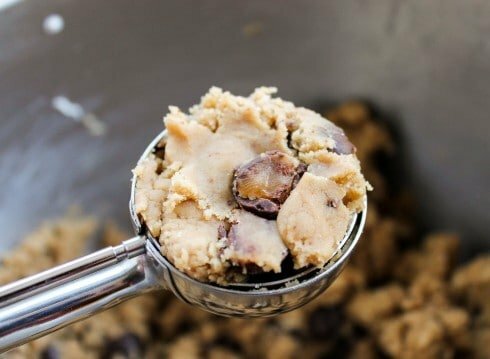 Do not put cookie dough onto a hot pan; stick the cookie sheet in the fridge or freezer for a couple minutes to allow it to cool down. *You must spoon and level the flour for this recipe. That means use a scoop to dump flour into your measuring cup, then scrape the top of the measuring cup with a knife to get rid of any excess. 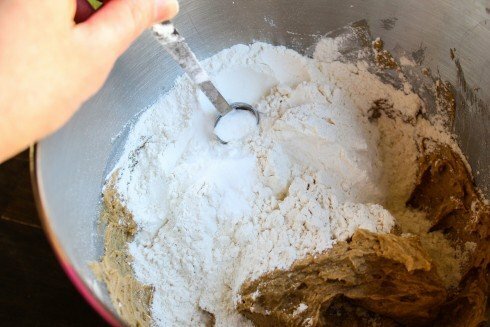 I’ll tell you my secret…Often when a recipe says to combine the flour, salt, and leavening in a separate bowl, I just pour the flour into the wet ingredients without stirring, then use a small spoon to stir the salt and baking soda into the flour before mixing it all together. Works every time. Cut the caramels in half. 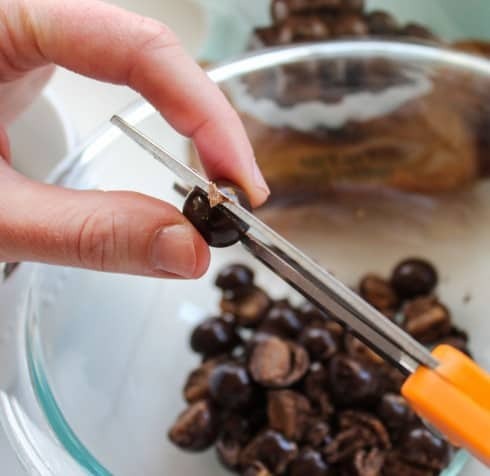 It’s easiest to hold onto both sides and gently crush the chocolate with the scissors. Like this. Otherwise you will get crunchy caramel oozing out the side of your cookies. Here’s what they look like straight out of the oven with no caramels pushed into the top. And there you have it. My favorite cookie. Hahaha grooming your thumb. I’ve done that too!! These cookies are the bomb! So I just finished making two batches of these for a church cookie exchange tomorrow. The cookies are yummy BUT can you check measurements on flour again? I’m in the Cleveland, Ohio area and my dough, using the 2 3/4 cup flour, was nothing but crumbs! I followed the recipe exactly. I used 2 3/4 cup of King Arthur AP flour that I sifted (after measuring) with the salt and baking soda. In order to get the crumbling “dough” to hold together, I had to take a handful and work it in order to form a ball. Then by hand I had to flatten and shape them into disks. It was a ton of work and there seemed to be too much of the butterscotch caramels and not enough dough even though I followed the directions exactly. 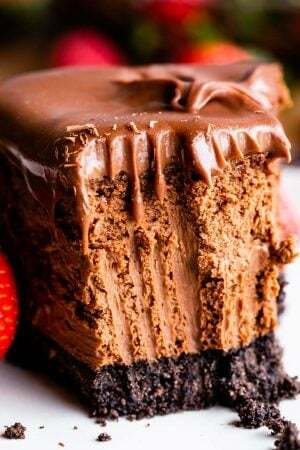 Just wondering if you can make these again and double check measurements. I have never had problems with elevation or weather impacting baked goods here in Northeast Ohio. I’m sure these will be a hit at the exchange but I am reluctant to give the recipe as something seems off. Hi Diana! I’m sorry these cookies were so much work for you! They have always worked for me as originally written, but I’ve had a couple other complaints that the dough was crumbly. So I made them again today, and I think I’ve found the problem. I’ve changed the recipe. I hope you can forgive me; I really do mean it when I call myself a food charlatan. :) I posted this recipe exactly one year ago, and I’ve learned a lot about using browned butter in baking since then. You ready? It’s not necessary to chill the browned butter. You only have to chill the dough once it is all put together. I think chilling the butter didn’t give enough moisture for the flour to absorb. I’m sticking with the 2 and 3/4 cup flour. They turned out perfectly for me today. As far as there being too many caramels, I think that might be a personal preference. I like the amount called for, but feel free to add less. I’m glad the cookies weren’t a complete failure for you, but I am sorry that it took you so long to get them done. The revised recipe is obviously a lot quicker because there is only one chilling step. Thanks for your feedback Diana! Have fun at your cookie exchange and Merry Christmas! Makes sense to me that the chilled butter wouldn’t provide enough moisture to absorb the dry ingredients. It’s also probably why the dough/caramel ratio seemed off. They were a lot of effort but hubby agrees it was totally worth it. Hopefully the ladies at the cookie exchange will benefit from our trial and error. Merry Christmas! I’m so glad you like them T-bone! Also, I’m really excited that I now know someone named T-bone. I think my cool-factor just went up like 10%. 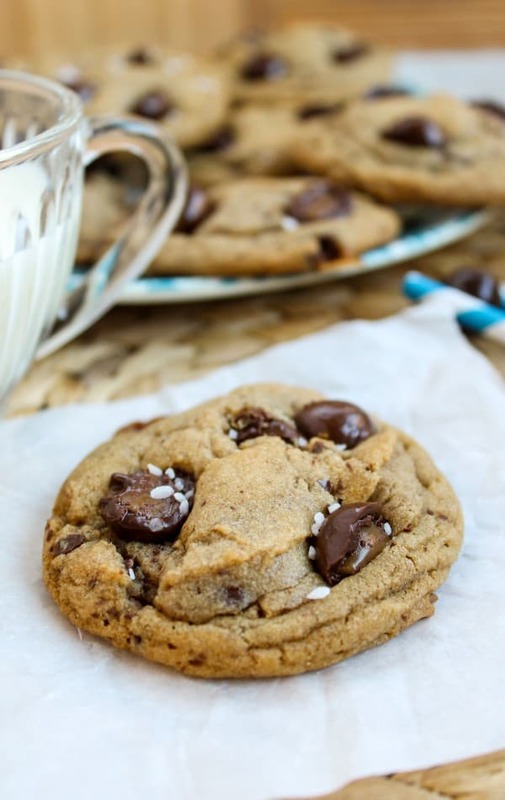 I have never browned butter before I made these, and it was just as magical as you claim. I am seeing some serious browned butter lovin’ in my future. I used 1/4 cup less flour than was called for and the soft texture was perfect (I live in South Texas, if that’s helpful). Also, I live like 3 and a half hours away from a Trader Joe’s and would never ordinarily be able to use the admittedly addictive butterscotch caramels if it hadn’t been for a Christmas present that included them. That being said, the cookies themselves are wonderfully butterscotchy and I think that just using butterscotch chips, or chocolate chunks, or both (!) would be great too. 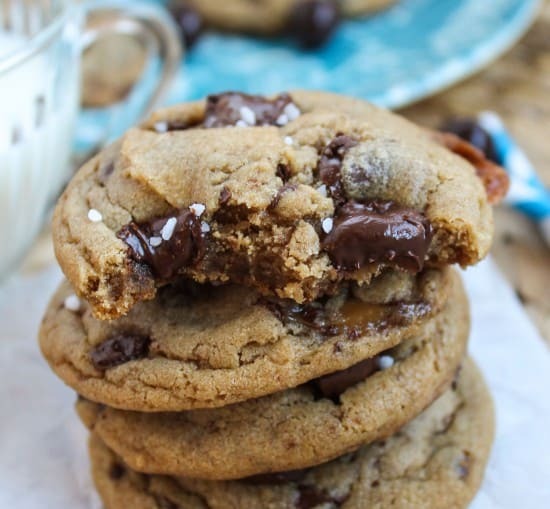 Ooh I like the idea of adding butterscotch chips to these!! 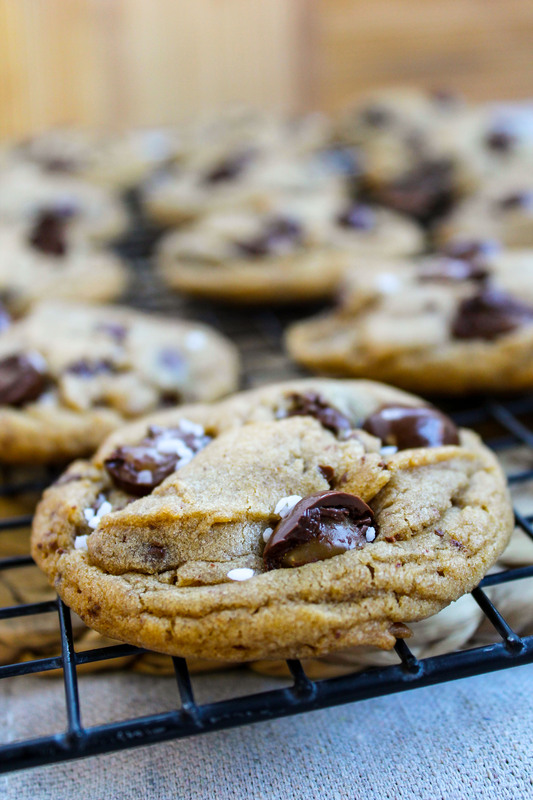 I’ve made these cookies with just chocolate chips before (because I ate all the caramels…oops) and they are still really good. Thanks for commenting on the flour, I think that the climate really does effect how much you need. These cookies are great. Amazing even. But your recipe for chocolate cherry cookies are the greatest of all time. Of all time! Only a brother would somehow be able to claim my recent Sriracha Cheddar Popcorn post as HIS recent post without even hacking into my account. I’m impressed Nate. I finally got to Trader Joe’s to get the chocolate covered caramels! I mixed up the dough a couple of days ago and baked the cookies. They taste super rich and can see how they could be addicting. My dough (even before I refrigerated it) was very hard. I broke my scoop trying to get it out of the scoop! That being said, I enjoyed making them, and will make them again. Thanks for the recipe, Karen. Donna! I owe you a cookie scoop! What a bummer. Others have said that the dough is really hard. It’s definitely not sticky, but mine is always able to be shaped just fine. Maybe it’s a climate thing? Try adding 1/4 cup less flour next time and see how that goes. I’m glad you still liked them Donna! I am making these tonight! And now that I know Alicia loved them I’m even more excited! I’ll even share one with my mom tomorrow! One! I’m in the second chilling stage of making these cookies. My dough looks a little dry though so I’m kind of worried. The dough was DELICIOUS!! I’ll let you know how they turn out. I’m so excited you are trying them Alicia!! Come back and tell us how it goes! Soooo……they were awesome! I only cooked up half of them and only allowed our home teachers one each because we are treasuring them. It was hard for me not to eat all of the caramels before making the cookies. They were great by themselves. 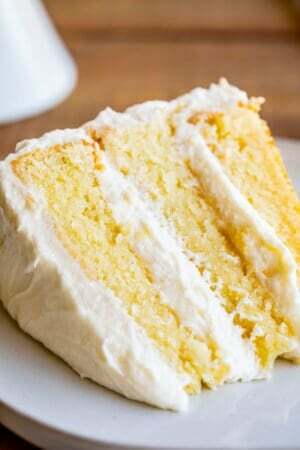 Thank you Karen for sharing this awesome recipe. I think they will be a new Halladay special treat. These cookies look incredible girl! 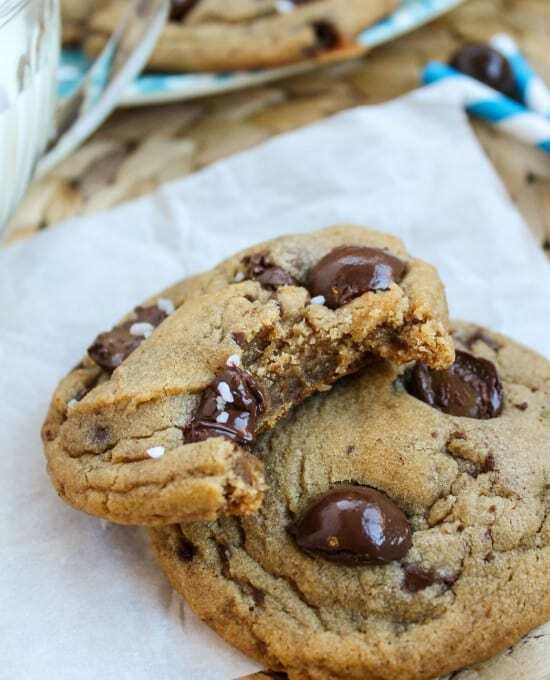 I love a good sea salt cookie, yummy! Thanks Pamela! I know, what is it with sea salt right? You’d think it was laced with crack or something. 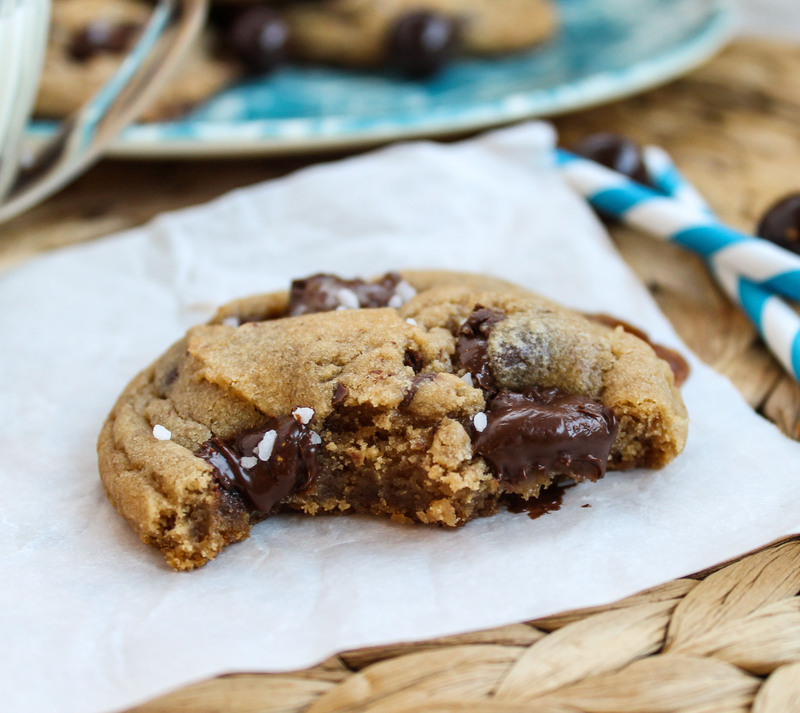 Wow… These cookies jumped out of bloglovin….and were like Laura read me first! They really honestly did. I bet they taste amazing…. Congrats and a great new recipe! Haha, thanks Laura! Funny how stuff jumps at you like that sometimes. Usually for me it’s anything that has bacon. Or brown butter. You had me at see salt! I wish we had Trader Joes in Canada so I could buy those caramels! Canada needs to get on the TJ train, dude! :) You can buy the caramels online, but they are pretty pricey. Write a letter to Santa! Thanks for the comment Mallory! PS I just want you to know that I, too, often wonder what my life would be like if I had never discovered Nutella. I’m definitely going on a hunt for these caramels next time I’m at Trader Joes. These cookies look amazing! Thanks Julie! You shouldn’t have to look too hard. They are displayed everywhere in the store. Or at least they are at mine. Maybe it’s just because they know I shop there and will buy 8 packages every time I stop in. They are providing opportunities for me :) Let me know how they turn out Julie! PS I’m loving the Cranberry Vinaigrette idea you just posted! That’s fabulous! I have to try that! Haha – dying about you grooming your thumb! It looks fab! Why do hands always look so weird in pictures?! 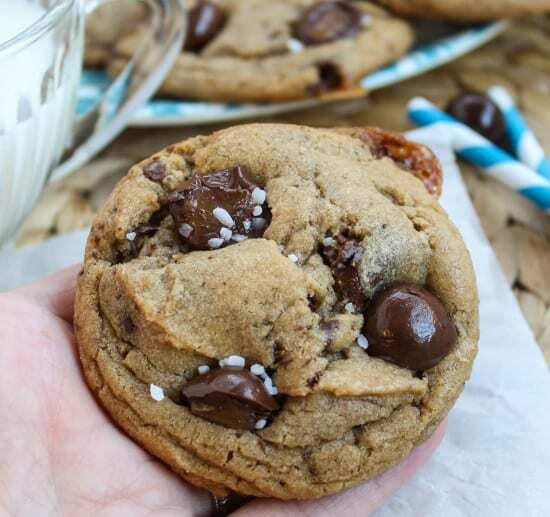 These cookies – wow – they look perfect! Can’t wait to try your recipe! Thanks Cate! It’s so true right? Hands either look like wax or like they are bubble gum pink. Or maybe I just need a tan? Probably. haha. 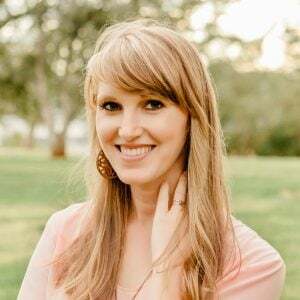 Cute blog Cate! you’ve got some awesome stuff going on over there…gingerbread donuts? I mean, that’s genius. Charred Brussels Sprouts? Awesome. Thanks for stopping by! Now I have to run away to Trader Joe’s immediately. These look so good! Thanks Jessica! Any Trader Joe’s day is a good day, right? haha at least it is for me! Ok, so first, the cookie I would make, hands down – Gramma Prudy’s Gingersnaps. Very crispy and crunchy! 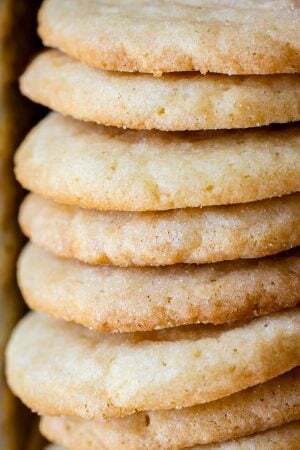 No chewy cookies can even match a good crunchy gingersnap or my grandmother’s thin, crunchy sugar cookies with a cinnamon candy in the middle. The BEST! Sorry Karen. You know I am a crunchy cookie lover – been so since childhood. I was raised on crunchy cookies. I think it’s genetic, because my Dad is the same way. All due to Gramma Prudy. Ok, so I totally believe that these are awesome, even more than awesome, even the best ever CHEWY cookie, but since I have no Trader Joe’s around you could possibly bring some of these caramels with you and make them while you are home . . . . ya think? Here’s what I think should happen: you should have a tray of these ready for the night that I get to California for Christmas. Sure, you’re leaving just a couple hours after I get there, but at least then I can eat your cookies while I’m sad that we won’t spend the holidays together.